At my university, we gearing up for round three of our elearning initiative. Our website hosts a bit of criteria to guide faculty interested in moving their courses online. Our centre will provide the support infrastructure and faculty will receive the equivalent course release stipend to work with us and develop the course. The biggest hurdle for instructors considering applying for the initiative is that they need to know basically what they want to do before they apply. We have been consulting faculty on a case-by-case basis, giving advice, brainstorming and assessing what aligns with their teaching philosophies, current assessment practices and goals. In an effort to outline the types of courses offered on campus within our institutional capabilities, I’m working on a basic primer for our faculty. As you may have noticed, it helps me to organize my thoughts by drawing it out, so I did a quick brainstorm, uploaded it to Flickr and asked for feedback. Alan Levine and Jac Calder were quick to respond with some really helpful points to consider. I had clumped Feedback into Assessments but my friends are correct, it is absolutely worth articulating how instructors envision students receiving feedback. I modified the drawing accordingly and re-uploaded. Over the past week, I toiled over writing the specific elements. It soon became a monster post and very Brock University-specific. So I’ll leave it at this for now. Please tell me, how does this look? What’s missing? What’s confusing? Thanks, Jeff. My director requested those to be broken out that way. This is great. I’m just putting the finishing touches on an course our centre will be offering starting in late February. 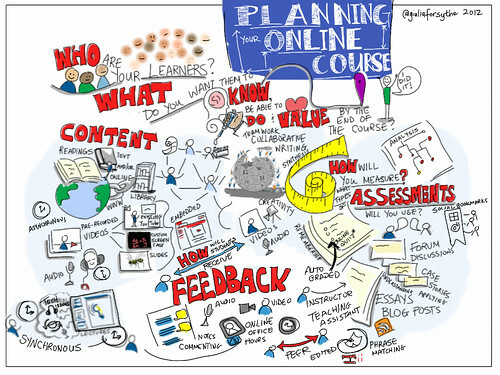 It’s an introductory course on teaching online aimed at our faculty and grad students (the plan is to make all of the course content, but not the discussion boards, wide open). I think I’ll be pointing the participants towards your graphic. 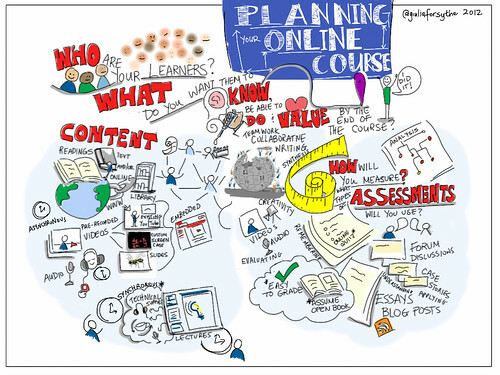 Your appealing drawing includes all the elements for online teaching strategies. I will show the image to my colleagues, with credit according to the Creative Commons policy. Thank you for this picture that’s definitely worth 1000 words!